WEST LAFAYETTE, Ind. – A new computerized system allows novice designers to convert static three-dimensional objects into moving robotic versions made out of materials including cardboard, wood and sheet metal. "We are taking inanimate objects and making them come alive," said Karthik Ramani, the Donald W. Feddersen Professor of Mechanical Engineering at Purdue University. The new system is called CardBoardiZer and has evolved from previous work based in Ramani's C Design Lab. "We wanted to create a system that's much easier to use than other design programs, which are too complicated for the average person to learn," Ramani said. "People can pick up CardBoardiZer in 10 minutes." For example, he said, an object like a plastic dinosaur with immovable parts can be scanned using a laser scanner and then turned into a folding cardboard version with moveable head, mouth, limbs and tail. "Once I have the rough shape, this system can take over from there," Ramani said. The models can then be motorized using a commercial product called Ziro, which grew out of work in the Purdue lab. Ziro uses motorized "joint modules" equipped with wireless communicators and micro-controllers. The user controls the robotic creations with hand gestures while wearing a wireless "smart glove." The CardBoardiZer system is described in a paper being presented during the ACM CHI 2016 conference, this week in San Jose, California (https://chi2016.acm.org/wp/). CHI stands for computer-human interaction. 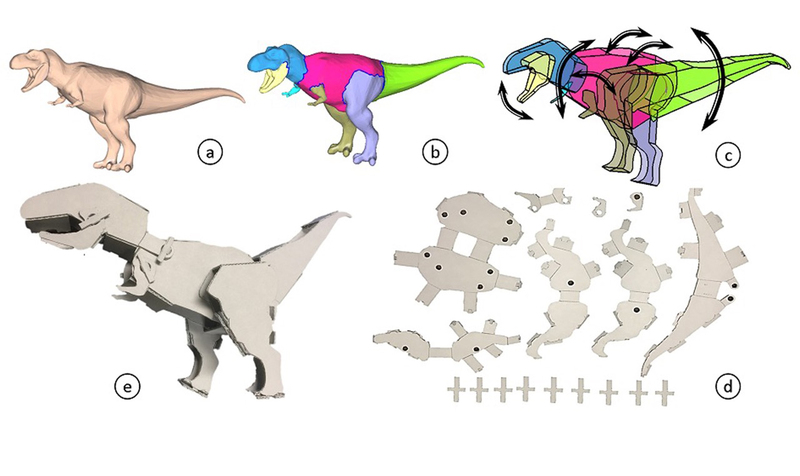 A copy of the paper is available at https://engineering.purdue.edu/cdesign/wp/cardboardizer-creatively-customize-articulate-and-fold-3d-mesh-models/. "We want everybody to become more artistic, to democratize the interfaces and accessibility of these tools so that they are more universally accessible and to lower the barriers to entry of designing and making these kinds of more sophisticated models," he said. Videos of CardBoardiZer are available at https://drive.google.com/folderview?id=0B5pvN1C9I3pbZjd4TURMMXFYVHM&usp=drive_web and https://youtu.be/Rnt3OCUTlZs. The system converts objects into flat versions similar to a tailor's dress patterns. "And then I can cut it, fold it and give it motion where I want," said Ramani, who has been teaching a popular toy design class at Purdue for 18 years, refining ways to make toys both educational and fun. The prototype technique represents a potential alternative to, and overcomes the limitations of, 3-D printing. "I can make a dinosaur this big," he said, holding his arms out wide. "With 3-D printing you'll be spending one month printing it, but CardBoardiZer works quickly with standard cardboard, wood or sheet metal." The system was inspired by a do-it-yourself "makers" movement and has a design focus. "Our geometric simplification algorithm can generate cardboardized models with a few folds, making it easy for children to fold and at the same time retaining a shape that the user desires," said Yunbo Zhang, a postdoctoral research associate who led the project in the C Design Lab. Ramani is a co-founder and chief scientist of the company ZeroUI (www.zeroui.com), which produces Ziro (ziro.io). The company is in the Purdue Research Park and in San Jose, California. Ziro was recently showcased during the Consumer Electronics Show in Las Vegas, where it was named a "Best at CES 2016 Finalist" by Engadget. Computer-aided design of ﬂat patterns allows designers to prototype foldable 3D objects made of heterogeneous sheets of material. We found origami designs are often characterized by pre-synthesized patterns and automated algorithms. Furthermore, augmenting articulated features to a desired model requires time-consuming synthesis of interconnected joints. This paper presents CardBoardiZer, a rapid cardboard based prototyping platform that allows everyday sculptural 3D models to be easily customized, articulated and folded. We develop a building platform to allow the designer to 1) import a desired 3D shape, 2) customize articulated partitions into planar or volumetric foldable patterns, and define rotational movements between partitions. The system unfolds the model into 2D crease-cut-slot patterns ready for die-cutting and folding. In this paper, we developed interactive algorithms and validated the usability of CardBoardiZer using various 3D models. Furthermore, comparisons between CardBoardiZer and methods of Autodesk® 123D™ Make, demonstrated signiﬁcantly shorter time-to-prototype and ease of fabrication.